Production got underway late last week on the set of Earth Horizon Productions’ ‘Eco Eye’ and ‘About the House’. Both series will film all over the country for the next few months with the former transmitting on RTÉ next January and the latter coming to our television screens late this year. Marcus Stewart (A Burning Question) is the producer for both shows which are presented by Duncan Stewart (The Changing Face of Dublin). The seventh series of ‘Eco Eye’ will shoot in areas all over the country between now and Christmas. It is presented by Duncan Stewart and focuses on Irish environmental issues. It will be directed throughout the weeks by several directors including Frank Delaney (host, Friday Night, Saturday Morning), Niamh Barrett (producer, No Frontiers), Blaithin Ni Caithain, Paula Keogh and Graeme Wells. The director of photography is Karl Dillon (Diary of a . . .). 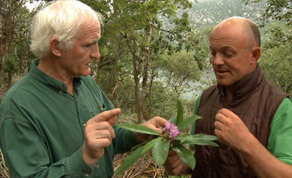 Past series of ‘Eco Eye’ have enjoyed audience ratings of well over 300,000 per episode. The eleventh series of ‘About the House’ will once again see Duncan Stewart focus on empowering householders on issues concerning design, technology and construction of new builds, extensions and renovations of urban and rural dwellings. Every programme looks to offer innovative design ideas, practical and ecological building techniques, stylish interior finishes and tips on how to make a home a safer and safer environment. Directed by Lisa Marconi (Mystery Files) it is to broadcast in November or December on RTÉ One.